This week’s Sepia Saturday 204 features royalty doing what is their core business: turning on a ceremony. It also ties to the 50th anniversary of President Kennedy’s assassination. My photos this week come from our personal collection from our time in Papua New Guinea during the 1970s. When I look at these photos now, what strikes me forcibly is the apparent lack of security. We could get within a very close distance of them without any hassle. It also impresses me in this day and age, that they are courageous enough to move through the crowds with minimal security where other world leaders have constant high security protection from the crowds who might want to see them. Queen Elizabeth II on arrival at Goroka airport, February 1974. Prince Philip, Capt Mark Phillips and Lord Louis Mountbatten near vehicle. Scout groups were highly profiled during this visit. 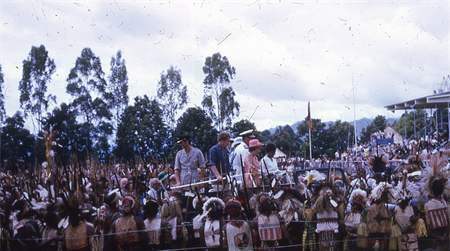 Queen Elizabeth II and her family visited Goroka in the PNG highlands in February 1974 while we were living there. She did various “meet and greet” activities and inspected a huge crowd of PNG nationals at the Show Grounds before travelling to Port Moresby. I also wrote about this visit in an A to Z post, using the same photo. The other reason this feature photo has relevance to the theme is that it includes Lord Louis Mountbatten who was assassinated six years later when an Irish Republican Army (IRA) bomb was planted in his fishing boat. 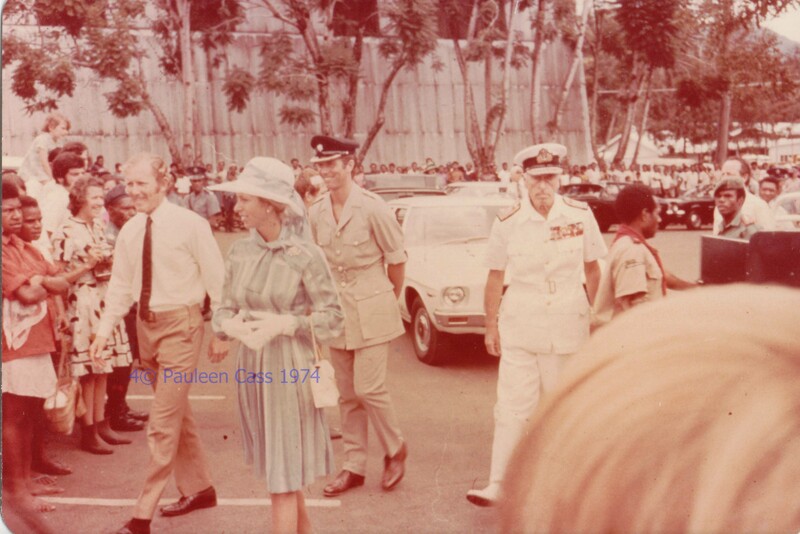 Capt Phillips, Barry Holloway MP, Prince Philip,Princess Anne, Queen Elizabeth II, Goroka 1974. Barry Holloway was the local member of Parliament and later Minister for Finance. Why not visit Sepia Saturday to see what other Sepians are featuring this week? This entry was posted in Family History, Papua New Guinea, Sepia Saturday and tagged Goroka, PNG, Queen Elizabeth II, royal visits, Sepia Saturday by cassmob. Bookmark the permalink. As you say – so trusting with what appears to be so little security, but it worked out all right, thank goodness. Wonderful pictures! Thanks La Nightingail. Mind you there were a lot of spears there which might have been brought to bear if someone had hurt Missus Quin as they called her. What a shame we can’t be so trusting anymore. A nice brush with fame for you. Indeed Jackie! Even at the time I was amazed how close we could get, and I’m not even a royalist. A memorable moment… great pics!!! Very nice pictures. Makes me wonder how much leaders of countries worry about their safety. Indeed Colleen, or perhaps they have so many other responsibilities they just have to assume their security detail will protect them. A memorable time for you, and the royals as well I’m sure. Yes it was quite amazing Boobook, as was much of PNG. The royals may have found these more unusual colonial tours of greater interest than the bread-and-butter ones like Oz. In a time not that long ago president Truman use to go for a daily walk. I enjoyed your unusual take on this week’s theme. It must take courage for world leaders to move around, knowing that despite all security an assassin may be waiting for an opportunity to kill. .
That’s so true Susan which is why I admire the British royal family for their courage. Remarkable contrast between low-security and high-security. The need for such protection makes me wonder why anyone would even want to be the leader of a country. I quite agree Wendy – it requires courage and commitment as well as a belief in oneself and the contribution that can be made. I am just wondering if you have some other pictures. I am from PNG and am actually trying to find a picture of my uncle who was the Queens chauffeur during this visit into Goroka. Its something I am proud of my uncle but don’t have any photo or picture to keep as a memory. I hope you have something. My email address is bobby.tana69@gmail.com should you need it. Very good pictures though.